A repetitive but fun action-shooter for kids and those young at heart. Like most gamers out there, I was pretty sure the whole “toys to life” trend had ended some time ago after titles such as the Skylanders series and Disney’s Infinity games cleaned out wallets all over the world. Leave it to Ubisoft to resurrect this fad like a phoenix from the ashes in their latest game Starlink: Battle for Atlas. While it can get a bit repetitive, it’s still a fun game that kids and those young at heart will enjoy, not to mention the optional sweet looking toys made for it. The story kicks off with a ragtag crew of space explorers doing their thing while using a special power source known as nova. Of course there’s some bad guys out there that want this power for their own uses, and the biggest of them all are the Forgotten Legion that are led by the feather covered Grax. They decide to storm your base ship and kidnap your leader who also happens to know the secrets of nova. Now it’s up to you and your team to get the leader back and put a stop to Grax and his evil plans. Oh, and the Starfox team is along for the ride too, if you pick up the Nintendo Switch version. I know, you’re thinking “wait what? Starfox? !” as that’s exactly what I said when I first learned about this game back during E3 this year. Not that I’m complaining, as it’s always awesome to see Fox and the gang in action, and they don’t disappoint here as they have some of the best scenes in the game as far as I’m concerned. Nothing against the main characters or anything, but they’re just some “by the numbers” stereotypes that check off all the boxes for a ragtag crew (unsure but stout-hearted young leader guy, cool but geeky guy, strong/fierce lady, and so on). But let’s get to the meat of the game, the sweet toys you’ll be using in your quest that attach to your controller (the Switch version comes with a special JoyCon holder you slide both of them into). Each spaceship you use consists of the main ship, a pilot, and two weapons you can attach together and swap at anytime. Much like the Skylanders games, you’ll find yourself swapping weapons and pilots quite a bit as each of the seven planets you come to have their own unique challenges to overcome, and you’ll have to swap parts to face them. For example, you’ll come across enemies that can take extra damage from fire or ice weapons, or can unlock closed areas with certain ones, and each pilot has their own unique special ability such as Fox being able to summon his Starfox buddies for some brief backup. It’s up to you how you use these abilities and weapons as you take up different quests on each world, which range from fetch quests to taking out “X” amount of enemies. This is where both the fun and frustration kicks in as while I had a good time helping out on each planet, the missions can get really repetitive as you’re forced to keep doing them in order to build up resources and a base on each world (ala No Man’s Sky) in order to move on to the next one. It can also feel awkward using a spaceship on the ground in missions where you’re forced to do so in order to pick up materials, or you’re suddenly in low-power mode, etc. Here you can strafe to dodge attacks while firing back, and thankfully the controls are spot on during these missions and especially when you’re able to fly and jump into some dogfight action in space, which is by far some of the most fun you’ll have playing this game. There’s also some cool bosses and boss-like levels reminiscent of Starfox where you have to fly inside a giant base or ship and blow up the core while making a hasty escape. While this one is available on all of the major consoles, I was given the Switch one to review. The graphics and sounds are pretty good for this version, though there is popup with some of the terrain and objects here and there, but nothing too distracting. The Starfox Arwing toy that comes with the physical version is nicely detailed, and all of the ship parts, pilots, etc feel solid and snap together perfectly. You’d think something like this would be heavy or cumbersome to have on your controller while playing, but it’s surprisingly light and doesn’t interfere at all. You can even be funny and detach the wings and place them on backwards, which will also show up backwards on the game as you play. The sad thing is while I like the starter set and the toys in general, you actually come out better buying the the digital version, as for $80 you can get all the other ships, pilots, and weapons in the digital deluxe version. But if you decide to buy all of the stuff physically, you’re going to be shelling out around $400 or so, beginning with $75 for the starter edition kit. 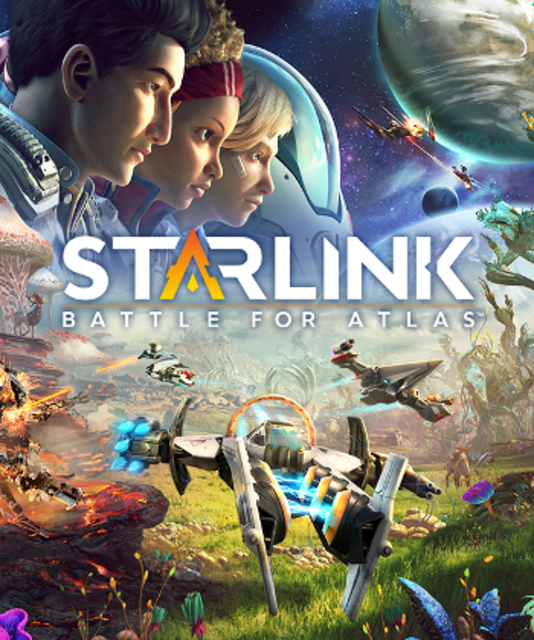 If you’re still a fan of the “toys to life” games and enjoy space shooters like Starfox, you’ll want to link up with a copy of Starlink: Battle for Atlas. While you come out better game and money-wise buying the deluxe digital version, your kids or inner-child will love having the physical toys to play with while fighting your way through space and saving the day with Fox and gang, along with the generic but fun ragtag main cast.